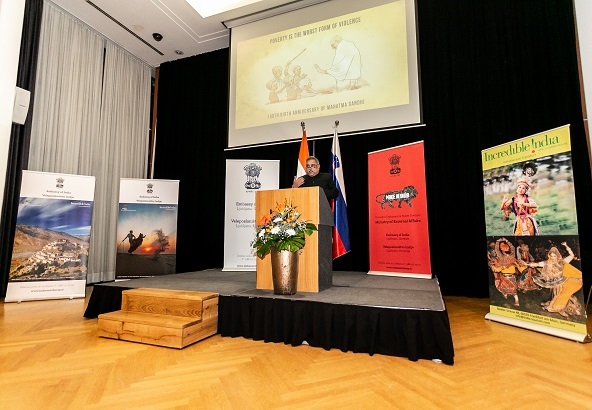 The 70th Republic Day of India was celebrated in Ljubljana, Slovenia, on 26th January 2019. The morning function, which was attended by more than 70 members of Indian Community, staff members and their families, started with the singing of the National Anthem. Ambassador Param Jit Mann read out President’s address to the nation. Patriotic songs were sung by some members of the Indian community. In the evening, a Reception was hosted by the Ambassador at the Grand Union Hotel, Ljubljana. The Reception was attended by approximately 150 eminent personalities including Mr. Alojz Kovsca, President of the National Council of the Republic of Slovenia, Mr. Alojz Peterle, Member of the European Parliament, Mr. Mitja Bervar, former President of the National Council and senior officials from Ministry of Foreign Affairs and other Ministries, members of diplomatic corps, people from the fields of literature and culture, Indian diaspora and friends of India. Ambassador addressed the gathering. During the programme, a LED projection on Mahatma Gandhi, provided by the Ministry, was screened. Ms. Ana Vipotnik, Slovenian singer who sang “Vaishnav Jan” was felicitated and presented with EAM’s appreciation letter to her. Recording of the Bhajan was also screened during the Reception.